Running and sports put feet and ankles to the test. Over the course of a few hours (or even a few minutes) you need to be able to run, jump, land, cut, pivot, plant, juke, and more. This places enormous stress on your lower limbs, and you expect them to do their job without pain or problem. Towel calf stretch. Grab a towel, shirt, resistance band, or other sturdy piece of cloth that you can loop around the bottom of your foot from a seated position, legs out in front. Grab both ends of the towel and pull towards yourself until you feel the stretch behind your ankle. Ankle inversions and eversions. Again from that seated position, turn your foot as far inward (inversion) as possible, then as far outward (eversion) as possible. Plantar flexion and dorsiflexion. Finally, from that seated position, flex your toes upward toward your knees as far as possible, then point them down and away as far as possible. Walking or light jogging. A bit of jogging before an intense workout is, of course, great for getting your lungs and heart warmed up and ready for activity. But it’s also great for getting your feet and ankles in gear. 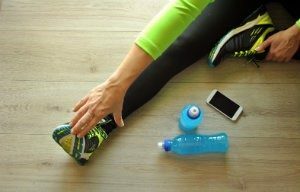 Getting your feet and ankles prepared for activity doesn’t take much time or effort, and it can help strengthen and support lower limbs and protect them from frustrating, time-consuming pain and injury. If you do get hurt, though, your best bet is to make an appointment with Dr. Joel Brook at Dallas Podiatry Works. Sports injuries that don’t get prompt care can often become chronic, recurring problems. Our office focuses on bringing full healing fast to you can return to your activities as quickly, yet safely, as possible. To schedule, give us a call at 972.566.7474.